In August, I deactivated my facebook account, and temporarily cut myself off from almost 1400 people, becoming a facebook refugee. I chose ” I do not understand how to use facebook” as my reason for deactivating from the choices shown above and did not explain further. One month later, here is the explanation. 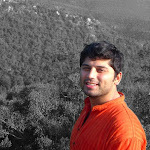 I had become fed up with the dependence on the website to keep in touch with people. I had traveled across the country the week before, reconnected with several old friends who I haven’t seen in years, and developed a theory that facebook had cheapened conversations with my normal correspondences. In addition, while watching the previews for INCEPTION, in Omaha, I was disturbed to see that there is a movie coming out about this thing very soon. I think that social networking might be getting out of hand, and wanted to see what life was like without it, at least for a month, and thus deactivated my account. The short term absence from it gave me some ideas for new academic research that I might collaborate with my mentor at U of L. The alienation from the community is definitely impactful, especially to someone who has moved to a new place with limited contacts in the area. I realized in my first month, facebook-less in the city of Louisville, that the people I started meeting were forming an impression of me because I wasn’t eligible to be their online friend. Mostly, these impressions were not favorable. And it’s this behavior that is fascinating to me. Too often journalists warn about negative impressions employers, co-workers, friends and lovers form of us based on what we do on the book, but I have yet to see anything talking about the consequences that the offline community faces. I estimate that less than 2% of my friends are not on facebook. They’ve missed out on seeing thousands of pictures, getting early notices on earthquakes, invitations to exclusive parties, status updates about their friends dog, and other information that fascinates us in our online lives. In the process of deactivating my account, I backed up my pictures, obtained email address from 25% of my friends who responded to my going away status message, and did some research on other facebook refugees. What i found was quite interesting…. There was a time when if you typed the word “Delete” into Google, the automated text following would be “facebook account.” To counter this, facebook made it very difficult to deactivate, or even delete. 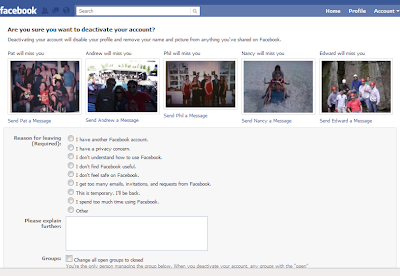 Accounts are not actually deleted for 14 days, and deactivating an account is just temporary. Deactivated users still get emails about events and activity on facebook, and in my experience, more of it. It is nearly impossible to export your contacts (they claim there is a way to do it through Yahoo, but it did not work for me.) Backing up my pictures took an hour or 2, because I had to save each one individually because none of the applications actually worked. 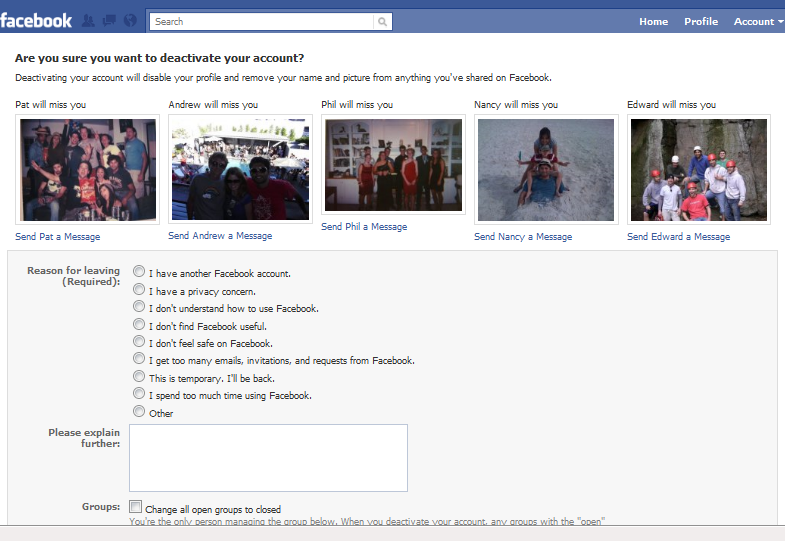 Deactivating my account also removed pictures I tagged of other people, leading to an angry phone call from my little brother who lost his profile picture of surfing a wave in the pacific. I maintained contact with many friends during my time off, but I did notice several people missing from my life. I missed having people share silly youtube links, new music, pictures from a houseboating trip, or others things that I admit enjoying on the facebook. Although these things were trivial in nature, it was a gloomy stage that I will not forget from my mid twenties. Is society allowing facebook to have a monopoly over our friendships? Here are experiences of others turning their backs on facebook…. Suddenly I was bombarded with chats from people in Bombay, Hyderabad, Australia, Europe, California, New York, and even Canada. I got sucked back into the newsfeed, and realized that it was not the time for facebook and me to part. However, I have a new perspective on this thing, and suspect that someday I will have a better opportunity to move away from this culture without being alienated from the people I care about. When that day comes, I hope you will be with us.